Do you respect the feelings and emotions of others? Do you value the care and love of the dear members of your family? Why do some people choose to be indifferent and cold to our love and respect? Isn’t affection reciprocal? These questions have troubled me many times and I have been trying to understand the reasons. Over the years of studying various persons and their demeanor, I have drawn some conclusions. They may not be wholesome but they do offer some interpretations. There are people who make you feel insignificant, who don’t respect your views, who try to belittle you. We all come across such people and sometimes we wonder what is their problem! Why is it so hard to impress them? Insensitive people don’t care! Their own opinion, needs and self-esteem are so significant that they can’t think beyond that. They may not communicate it openly but their body language, their looks and their silence speaks volumes. They lack emotional quotient: Emotional quotient is the ability to understand and handle our emotions in such a way that we appreciate the sentiments of others, learn with each step, each experience and move ahead, without getting emotionally scared or charged. Insensitive people are emotionally challenged. They cannot perceive or assimilate emotional vibes. They consider emotions to be superfluous and therefore they turn a blind eye to the affection of people around them. They pick it up from family environment: Our upbringing makes a gigantic difference in making us considerate, respectful and thoughtful. A family that nurtures the values of being reverential and selfless passes them on to posterity effortlessly. If selfishness and callousness is not checked at an early age; if some member of the family exhibits such traits, children unconsciously pick them up. They are insecure and jealous: It is hard to believe but it is true! It is their own insecurity that makes people insensitive. Other members of the family seem to be their competitors. They tell themselves that there is no competition but actually they make it so in their own minds. They want all the attention, they want to impose their views and feel all-important. Some childhood insecurities could be driving their thoughts, which they choose to conceal. They are selfish and self-centered: When we give top priority to our own interests, when we expect even our spouse and children to follow us in all our decisions, when we don’t see beyond our own desires and expectations, how can we develop sensitivity towards others? It doesn’t strike us that they may not like our choices and if it is pointed out, we tend to take offence. They are puppets: Insensitive people are weak-minded and are usually controlled from behind. They tend to dance according to the tunes of their puppeteers as they have been conditioned to believe them blindly. All their sensitivity and loyalty leans towards their manipulators and they are likely to pick up the traits of those persons who could be their most respected mentors. They behave the way they have been told to, without using their own logic. They learn to become manipulators: Those who do not react to manipulations aggressively absorb this conduct unconsciously and insensitivity is one such peculiarity. Insensitive people seem to have one-track mind. Since they have been brainwashed for a long time, they fail to recognize the emotional aspect of feelings and opinions. Are they incorrigible? It is very difficult to change such people as they consider themselves to be superior, their self-image is far better in their own eyes than what others consider them to be and they don’t want to be directed. They detest being told that they lack something. But that doesn’t mean we should not confront them. If we keep telling them that they need to rethink, that their demeanor is unacceptable, they might introspect and make some efforts to learn being sensitive. While society immediately points a finger at insensitive remarks made against protected groups, this kind of behavior is often ignored in families. Do you know any insensitive persons? How do you react to them? Do you ignore their behavior? I would love to hear your views. These are all very astute and perspicacious insights Balroop, for which many thanks. I tend to think of human sensitivity as being on a sliding scale: on one end we have a form of saintliness and on the other a clinical psychopathy. One has to bear in mind, of course, that we are never fixed entirely at one point on the scale, and circumstances will cause us to move along the scale in either direction – unless of course we are indeed saints or psychopaths. Still, as your article suggests, we tend to gravitate to a default position on the scale, and for most people, assessing where that point is can be extremely difficult, as it is their norm, having been embedded by years of conscious and sub-conscious conditioning, just as you describe so well. Best wishes, Hariod. I am extremely grateful for your profound perspective about human tendencies, sliding time and again on a ‘scale’… a very interesting analogy! I have known a lot of insensitive persons, both within my extended family and at my workplace. Most of them swayed by their own success and ‘upmanship’, mentored by menial pursuits, exposing themselves but living in an illusionary world with the satisfaction of having vanquished all whom they considered to be their rivals! I that negative atmosphere, I learnt to be positive albeit with a lot of effort but also learnt some unforgettable lessons of life. Thanks for understanding my thoughts so well. With reverence…Balroop. Hi Balroop, your post presents a thorough analysis of the reasons for insensitive behaviour. To elaborate on the insensitivity in a professional set up, I would say that at times insensitive managers deliberately humiliate their subordinates to manipulate them, so that the subordinates puts in their best efforts to justify themselves and come out with all that they know. They see it as a way to extract the best without realizing the demoralizing effect on their team. I agree with you that whatever be the reason for insensitivity, maybe continual reminders can help to check such behaviour. I agree with you absolutely as I too have encountered such persons who sit at the helm of affairs and consider it their birthright to belittle their employees or colleagues, more so because they feel insecure or threatened by your proficiency and capabilities. I have avoided examples deliberately though I have many! My conjecture is that they are incorrigible because they don’t want to change, they feel their power lies in getting their work done in the petty tactics they adopt. Such people abound in families too. Thanks dear friend, for endorsing my thoughts and sharing your view about insensitive people. Stay blessed! I think you’ve covered it all, Balroop. I try to be charitable and think they don’t know better, but many people are incorrigible! Ah! goodness doesn’t affect them Corinne. They scoff at kindness and sensitivity. Thanks for standing by and sharing your view. I so enjoy your posts, Balroop. I honestly believe people do the best they can within the parameters of their upbringing and worldview. No one, as a child, wishes to grow up into a jerk, tyrant, or murderous zealot. Some people have the resilience and courage to make positive things happen in their lives despite a tragic start, and others are guided by fear. Fear’s faces are many, and the subconscious tactics manifest in anything from unkind remarks to global atrocities. When I encounter people who are insensitive, I wonder about the learning and fear that underlies their comments or behavior. To me, their actions are telling of an unhappy worldview, where one’s inner sense of security lies in laying others low. Their words often say something not about me, but about them, and fill me with compassion more than hurt. Thank you for such a positive observation and taking a kind view of insensitive people. You are right, we never think about the kind of upbringing they got and who made them adopt such a behavior. Yes, it speaks about the general outlook of people who fail to nurture the right values or lack the capability to do so. Probably you didn’t have to deal with insensitive people or never got associated with them for a long time. You are very kind Diana. I love the way you have given them a benefit of doubt to let them off the hook. I feel we have to take the responsibility for our acts and demeanor after a particular age. We get many opportunities to introspect, learn and change ourselves. Thank you for coming over and sharing your beautiful perspective. I wish I never had to deal with insensitive people, Balroop. Unfortunately, they are everywhere! But I see it as their problem, not mine. I’m not silent, but I don’t speak from a place of anger either. I want to understand what’s behind their words, why they would say what they say, what’s troubling them that makes them cold or lash out. By taking a “curious” approach, I hope to help them see that their choice affects how they’re perceived and their relationships. I tell them how their words affected me. Sometimes people have no idea that what they are saying IS insensitive and talking about what happened is eye-opening for them and they can make different choices next time. Sometimes a painful truth is revealed that they hadn’t the courage to share. If someone is too fearful to shift their ways or envision another perspective, then at least they have my feedback to mull over (or not), and I have the choice about what I’m going to do for my own happiness. I appreciate your mature outlook towards insensitive people, especially those who are not even aware of the meaning…could be again due to lack of exposure to finer emotions or having lived with too much of insensitivity to differentiate. I am so happy to hear that the negativity of such people doesn’t even touch you, such emotional balance is so rare. Thank you dear friend for taking this discussion a step further in understanding insensitive people. Love your insights. While saintliness happens from birth or triggered by a later life-changing incident, insensitivity may have its origins, as you rightly put it, in unhealthy upbringing. A well brought up individual may not become saintly but will certainly carry positive traits of head and heart right through life, in turn salutarily impacting people and environment around him. Whereas one cannot always get rid of insensitive people, they can be held in check by placing them alongside people of equal insensitivities, or freezing them into positions wherefrom their damage quotient would be minimal. Some of them may refine as a result of these punitive measures. Seen from another angle, such characters serve the larger purpose of highlighting goodness by their relative grossness…best wishes. Yes, I have always tried to see them from the other angle…they redefine goodness for us, their insensitivity convinces us that we can’t be like them as we know how much such an attitude hurts. So that is the brighter aspect, which is learnt slowly after we have gone through all those hurts and humiliation, all those put downs and sidelines. We may never get rid of them but we can avoid them, interact only when it is absolutely necessary but I wonder what to do if they happen to be in the family! any ideas? Thanks for an insightful comment, as always. Thanks for a prompt reply dear friend. I agree with you. This is bang on, Balroop! I have several of these in my family. The puppets and especially the insecure, jealous type. There is an unusual amount of competition in my family, I’ve learned over the last few years. I always believed we were working ‘together’ toward a common goal but that’s definitely not the case. There is too much competition between certain members which has led to jealousy and resentment. Unfortunately if a family is headed by a insensitive, unemotional, lacking in empathy then bad things evolve. Great post! I’m not sure whether these people are capable of change or not. I’ve yet to see it. Only those who have to deal with insensitive persons from a vey close range can understand our point so well! Thank you for being so honest! It is very easy to say they had a bad experience, had a disturbed childhood or were not raised with love but they can always learn to empathise, to understand other persons and to become a bit benevolent. NO! they can’t because they don’t want to. They do it on purpose! They know what they are doing or saying. NO they don’t want to be sensitive because they are only capable of what they have been doing…hurting and manipulating others for their own selfish motives. So true. Plus, they like to accuse you of being ‘too sensitive’ after they say sarcastic remarks. I always think…Let them dwell in a fool’s paradise, we can see through their pretensions and evil designs! Stay blessed dear! I’ve encountered several people, whom are insensitive and self-centered. It sort of goes hand in hand, right? I’ve made excuses for these sort of people in the past: childhood. mental illness. poor experiences. ETC….. But I’ve stopped offering them excuses for their poor behaviors and now want them to begin taking responsibly and ownership for them. What do I do? Stay away from them as much as possible. You are absolutely right! How long can you excuse them? There comes a point when we feel if we can learn, why can’t they? We all have to take the responsibility for what we do or say. If they don’t want to change, let them be but they can’t be part of our lives! Thanks dear friend for such a straight forward view. Loved it. Over the years, I realized I could be insensitive by not saying please and thank you because NOBODY in my family ever did. When I started making an effort to do so with students, it spread into other areas of my life. Those two weeks and a random compliment can go a long way, but for many of us, it’s not a learned behavior due to the families we grow up with. You stand out as a shining example of what we have been discussing…there is always a possibility of change, only we have to make an effort and usually it pays off. Only those who choose to be insensitive remain so all their life. Thanks for coming over to endorse the opinion shared by most of us that there is a scope for change, if willing. I know some and I never quite understood how people can be so insensitive, jealous, so sure that they own the Truth and that if you don’t follow their path, you are not worth it. I spend years trying to show them the way. It must feel quite insecure to be such a person. I found them many excuses. But nothing worked and I lose much energy and faith in it. Cause we know Balroop that we can’t change people. The change come from within. The best to do is take distance with this kind of people. They seem to live on another planet. 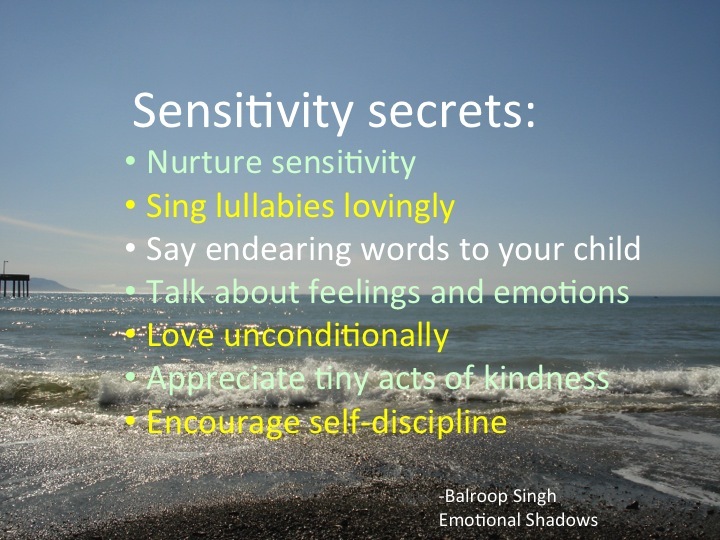 Wise advices on how to surround our kids with love and how making them sensitive and kind human beings. I keep this in mind. Yes Marie, it is indeed difficult to understand such people when we are young, full of idealism and enthusiasm, trying to put our best foot forward. It is only with some unpleasant experiences that we learn to tread carefully and try to discern the real motives of certain people. I agree with you, many times our efforts seem futile but we move forward with the satisfaction of having made them, that way we don’t have any regrets. Yes, change comes from within and the willingness to adapt and adjust. Thank you for sharing your personal experiences. I wish you all the best. Stay happy and blessed, that is my prayer for you. This was such an interesting read. Have to agree with you that some people are insensitive as a result of their surroundings – in other words they can’t help but show no sympathy to others. That is really unfortunate to see negativity spread like that. Sometimes I do think people are insensitive in the heat of the moment. That is, they think they are the most important during certain moments because their emotions get the better of them there and then due to stress. Over the years I’ve worked answering inbound phones in customer service and the demands some clients make to me and the company are extremely demanding. There were so many times where I’ve gotten yelled at and insulted because of poor planning on their part. In these instances, sometimes people are insensitive because they feel that their future is at stake. Then there are also the kind of insensitive people in social situations. I think we’ve all been in social situations where there is a certain someone who wants to talk all the time and not let anyone get a word in. In this case, I suppose as you say, these insensitive individuals are selfish, feeling the need to show off and put themselves first. Generally, I tend to let insensitive people be themselves whether they seem angry or happy. Never like making them angrier or bursting their bubble either way. You seem to understand people so well! Emotional Quotient plays a significant role in understanding and reacting to feelings and emotions of others. If EQ is nurtured and well developed, neither anger nor selfishness lets us being insensitive. Even if such persons want to be indifferent, they are very good at masking their true opinion. Whether we interact within our own family or with the society at large, insensitivity and facades can be seen by all, they may not make it very evident! Thanks for discussing all kinds of situations and adding another angle to this discussion. As usual, your post made me think. You have covered most aspects of insensitive behavior and the reasons for it, and your blogging friends have further shared their experiences that most of us can relate to. Yes, we do come across insensitive people at our workplace as well as within our families. The power games in this competitive world make people very selfish…so much so that they try every possible strategy to stay at the top. So they ignore others’ feelings. Although more often than not insensitivity is a learnt behavior, yet it is also to some extent a personal attribute. Some people are like that even when others around them, say their parents or siblings, are sensitive. Probably, early on at some stage they get away with it and then it becomes a habit. I am so glad my posts trigger more thoughts. I too look forward to learning more about the topics I share. I think all of us have our share of insensitivity and ways of dealing with them. Such a behavior never changes within the families, even siblings tend to indulge in this kind of demeanor once in a while. One thing is certain. When we talk about such people, our discussion does bring about some awareness…may be awakening a few out of their slumber! Thanks for standing by and adding value to this discussion, much appreciated. Thank you for confessing that many times we cannot make out what is wrong with certain people! It is only when we start exploring deeper that we figure out their motives and reasons. I am so glad that my humble attempt at sharing my experiences are helping. You have raised a very pertinent point and it is pressing question. It keeps nagging us and we find it very difficult many times, how to deal with such people. Should we react hastily or respond to them with prudence, we try but we are never satisfied how we handle such people. It is perhaps entrenched in the composition of their thinking and the way they have been brought up, the upbringing…factors like inferiority complex, insecurity, jealous and lack of self-confidence takes over them, and they behave as per the imposed artificial frame of mind. I agree with you, it is very stressful to face such people especially if they are around us each day, in the form of colleagues or family members. They are indeed hard nuts to crack as they consider themselves to be perfect…that is their main problem. They can only consider change if they realise what that are lacking but far from it! Whatever the reason of acquiring such a personality, they have to move beyond that and look at themselves. More important is, somebody has to point it out to them that they are insensitive. Who can do that in this world, which likes to be non-judgmental? Only close friends can dare to do that. Probably that could help them. If then also they don’t pay much attention, then sure they are incorrigible. I still have hope for them. Enlightenment can come at any time. Some experiences are miraculous. Thanks for your insights Nihar. You too have a blessed weekend. You are right, patience and respect are the most valued traits of humanity but perfection is quite challenging and painstaking. We can only make humble attempts to attain it. Lets hope insensitive people understand the need of introspection and ethics because often such people don’t pay any attention to values. I am so glad that we have discussed this topic in great detail, hope it changes some hearts. Thanks for standing by and adding so much value to this discussion. thank you Balroop for writing this piece and looking at the reasons some people are insensitive. I appreciate Diana’s take on this issue and concur! There’s not a whole lot we can do with insensitive people. Short of avoiding them, these strategies sound pretty good – extending compassion, becoming curious about their nature but letting other people own their behavior. Other people can be insensitive but we don’t have to allow them to ruin it for us – we control how we respond to them. We control how we respond to their insensitivies. I have a feeling the insensitivity comes from fear or an unhealthy upbringing. A lot of times the people they have become is out of their control. Thanks for such a prudent observation about insensitive people. I know you would always extend compassion in trying to understand them, that is why you are Vishnu…so true to your name. Whatever I have penned down is based on my experiences with such people, they are all around us and at a young age we fail to recognise their motives, we could be naive enough to trust them and let them hurt us. It is only after we have had those unpleasant experiences that we try to accept the ways of the world and develop empathy. I agree with you, they could be the victims of shoddy parenting but they can’t hide behind this excuse all their life. I thank you for adding your valuable opinion to this discussion. Have a nice weekend. If at all possible, I try to ignore those types of people, and perceive the defect as “theirs”, and not mine. That seems to work best for me. A very cool approach! That also means that you don’t get affected by their indifference and all those negativities that this post talks about!? Wellllllll…..I didn’t say I was perfect. 🙂 But I do the best I can to not let them affect me. I like that attitude and capability. Stay blessed and have a nice weekend. I have a whole family of in-laws who are insensitive, callous, self-centered, and so on. The new generation continues in this tradition. I’ve tried to let things go. That option didn’t work for 20 years. I then tried to confront them. This also didn’t work. They closed ranks and made me the culprit and outsider. There is no solution or remedy I’m sorry to say. They make us resilient and wiser. We learn to forgive and forget. They keep on wondering what is real happiness, while we achieve it through detachment. They have no idea how happy relationships can be cultivated, they are the losers, not we! Let it GO! Forgive them. Thanks for visiting my site this weekend. I am glad you liked my new post about why bloggers can better navigate life than other people. I agree with you, sadly, that people are insensitive. I agree with your reasons as well. I think everything you say in this post has merit, Balroop. Overall, however, I think that people who are insensitive (I’ve known many) lack a capacity for empathy. For whatever reason, they are incapable of “trading places,” so to speak, with other individuals. In essence, they are totally egocentric, and feel as if the world exists solely for them. I seriously doubt that individuals like that are capable of change, so we are left with the dilemma of whether or not to accept them as they are. In some cases, there may be other redeeming qualities that make the effort worthwhile, but in some instances there may not be. I have known both. Thank you for finding this post worthy of discussion for obvious reasons – insensitivity directly affects us and incapacitates our efforts to be good and kind. There is no doubt that such people have a bloated ego, gratitude never touches their cold hands and arrogance keeps them submerged in their own self-regulated domain. What can we expect from such people? We can only say…May God bless them but blessings can only be received by those who are ready to accept them, who keep an open and welcoming mind. Having been the oldest, in charge of my 2 brothers, i think i learned to be courteous and listen. I was helping my mother with chores (my brothers helped inside in winter, outside lawn and gardens, cars in summer.) But as I grew older my.Mom had my brothers and Dad do their own laundry saying I was studying to learn or babysitting to make money. Thank you so much for finding this old post and sharing your own experiences. My boyfriend is insensitive. I could literally be doing something important to my career and life And he would diss it or he would yell at me during a phone interview. What should I do to deal with him? Hi Nora, I am sorry to hear that your boyfriend doesn’t respect your emotions. I think you must talk to him about it, communication is the only way of conveying your thoughts and hurts. Yelling has never solved any issues, please tell him that you don’t like and stop tolerating it. If he doesn’t introspect, probably you may have to. Thank you for reading and sharing your emotions. Be Yourself! Life is beautiful beyond all these issues. Stay positive.